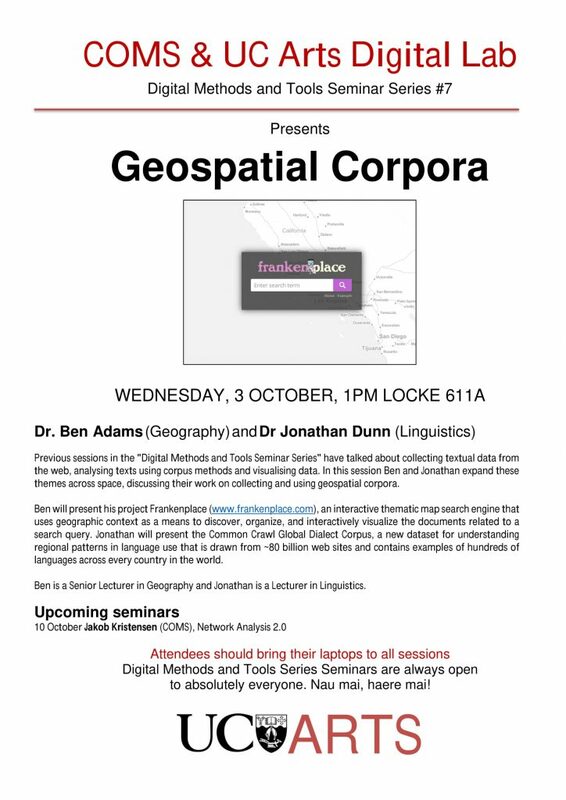 Dr Ben Adams from Geography and Dr Jonathan Dunn from Linguistics are presenting on “Geospatial Corpora” as part of the COMS and UC Arts Digital Lab “Digital Methods and Tools Seminar Series”. Ben will present his project Frankenplace (www.frankenplace.com), an interactive thematic map search engine that uses geographic context as a means to discover, organize, and interactively visualize the documents related to a search query. Jonathan will present the Common Crawl Global Dialect Corpus, a new dataset for understanding regional patterns in language use that is drawn from ~80 billion web sites and contains examples of hundreds of languages across every country in the world. Ben is a Senior Lecturer in Geography and Jonathan is a Lecturer in Linguistics. © 2019 UC Arts Digital Lab.